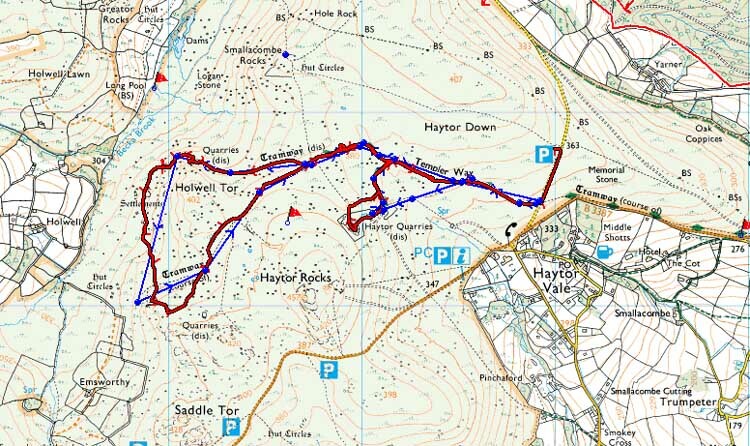 This walk: 2009-2-27. 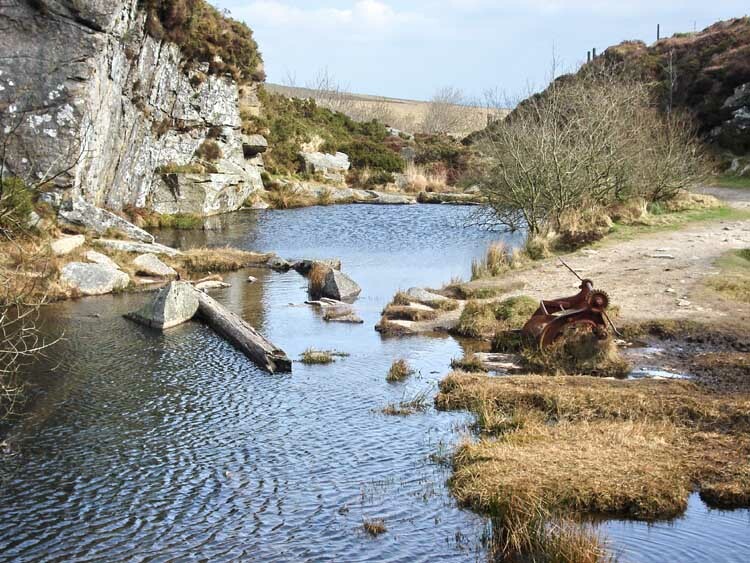 Haytor, granite tramway, main quarry, crane winding gear, crane jib, iron rings fastened into granite rocks, second quarry, Holwell Tor. 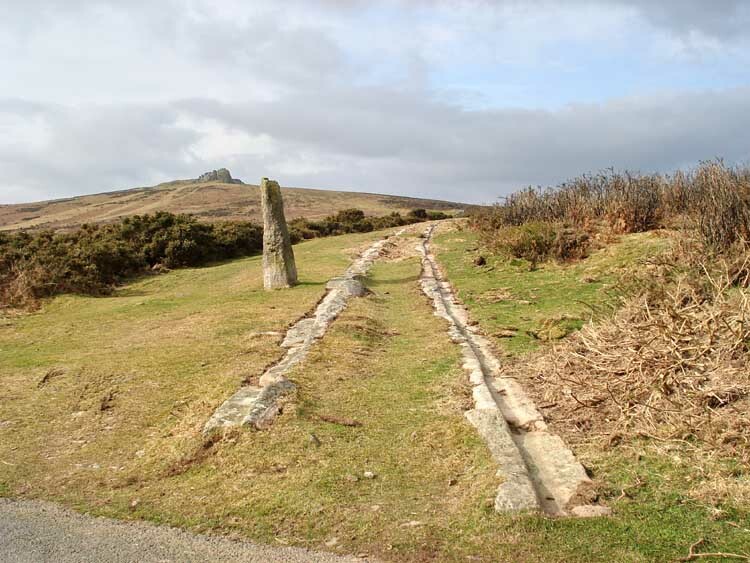 The start of the walk (after leaving the car park) at SX 76925 77528, showing the edge of the road, a part of the tramway and Haytor rocks in the distance. 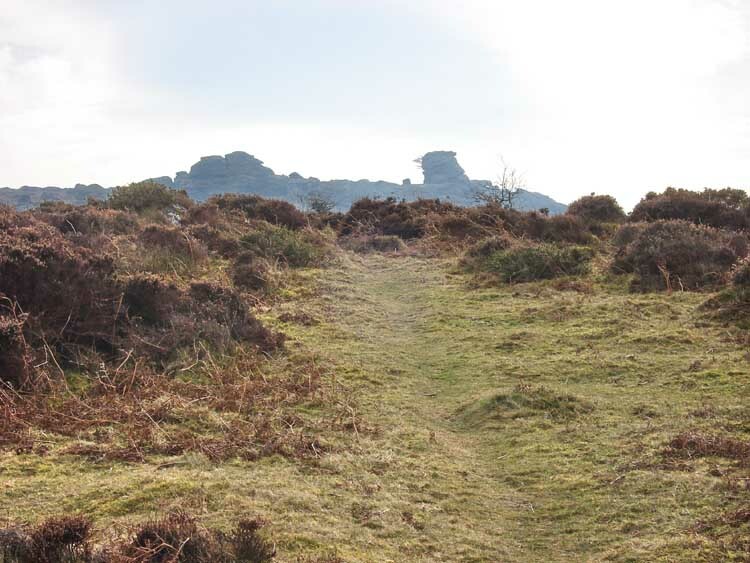 This is part of the Templer Way, running 18 miles (29 km) from Haytor to Teignmouth. 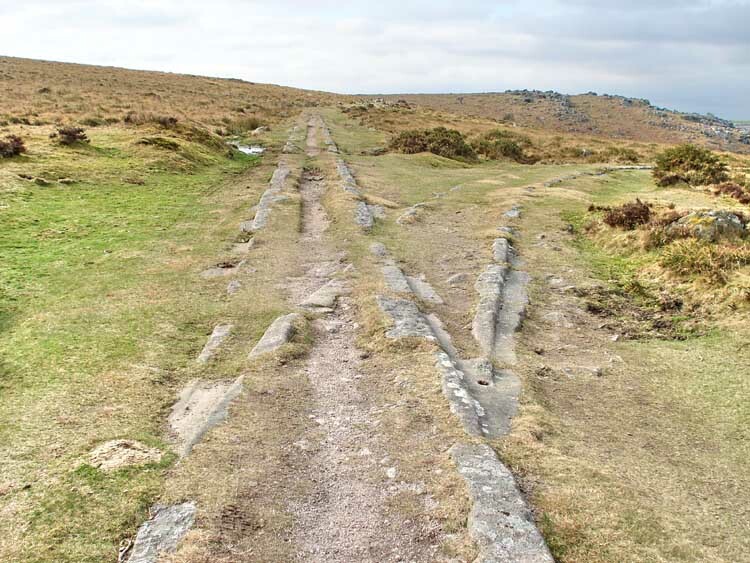 The tramway leading to the main Haytor quarry. 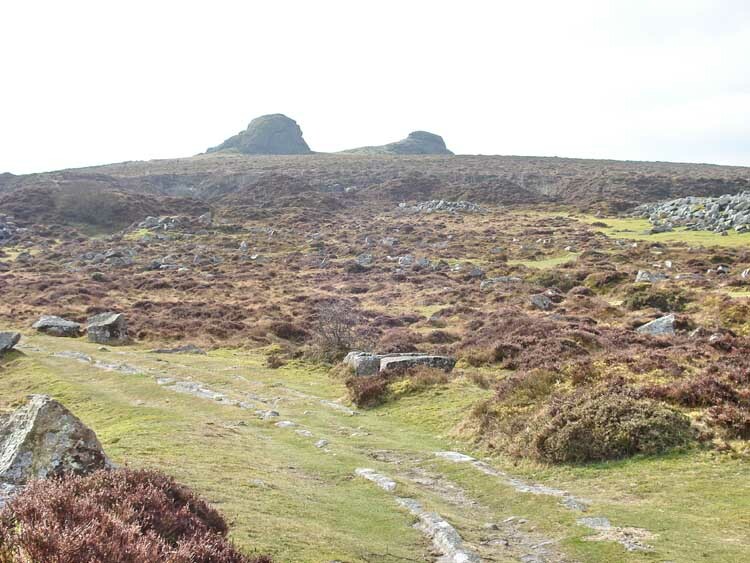 Note the two main rock piles of Haytor on the skyline. 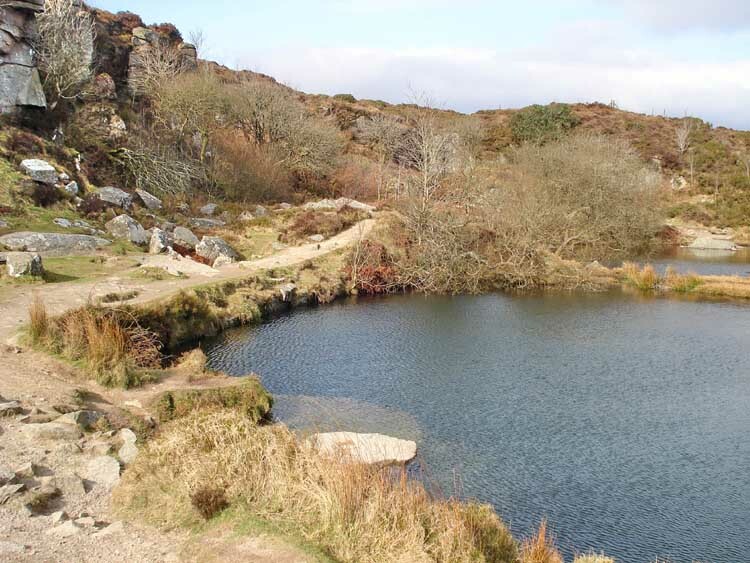 This is just a view en route to the main quarry. 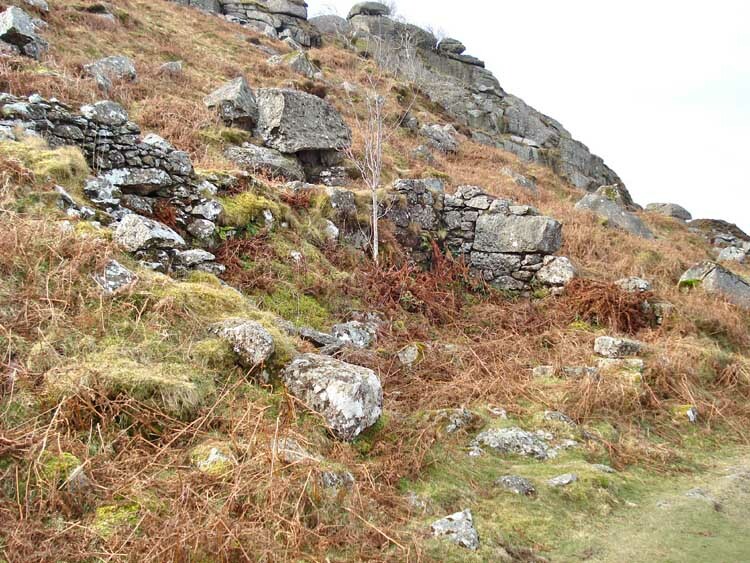 Looking at the overgrown entrance to the main quarry, at approx. SX 76055 77476. 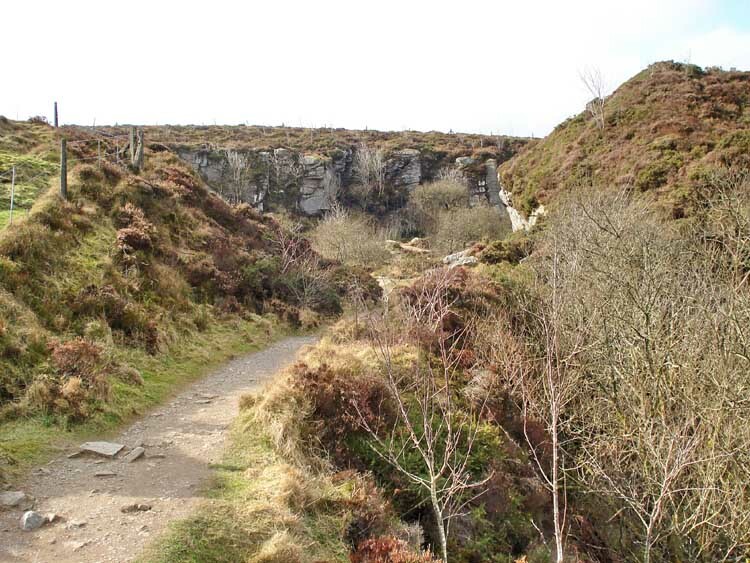 The footpath into the quarry. 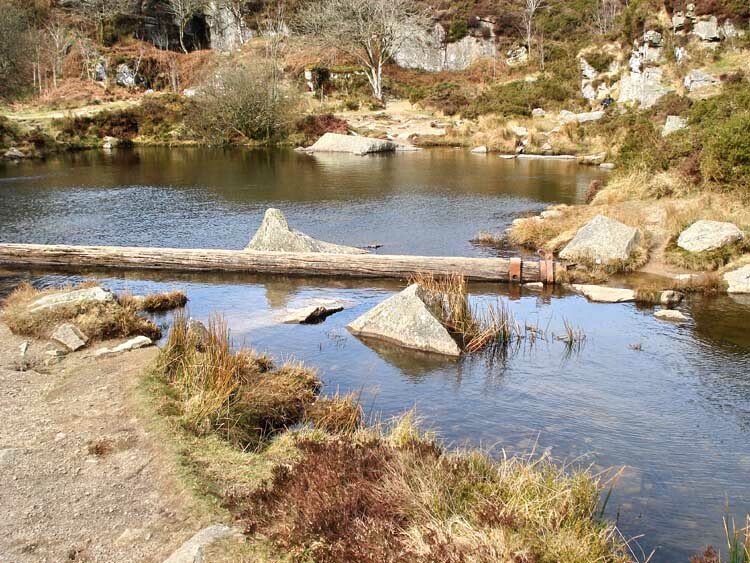 The quarry floor is now flooded, showing a possible crane jib or support. 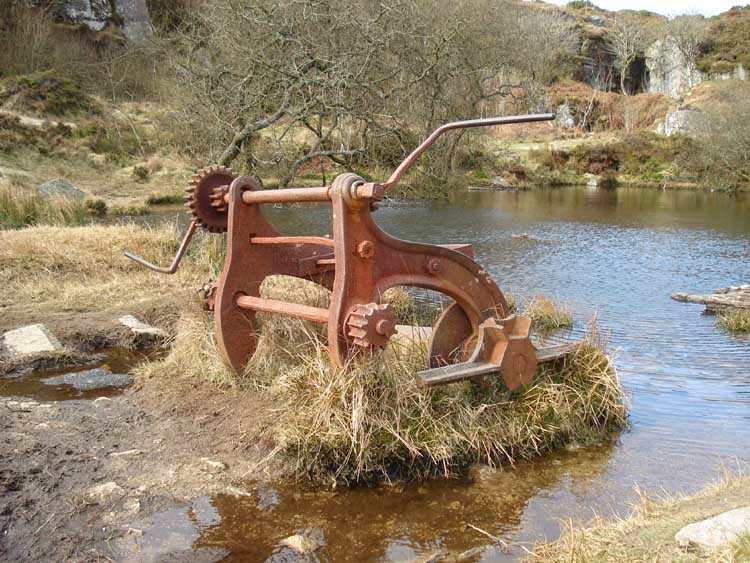 The derelict crane winding gear. 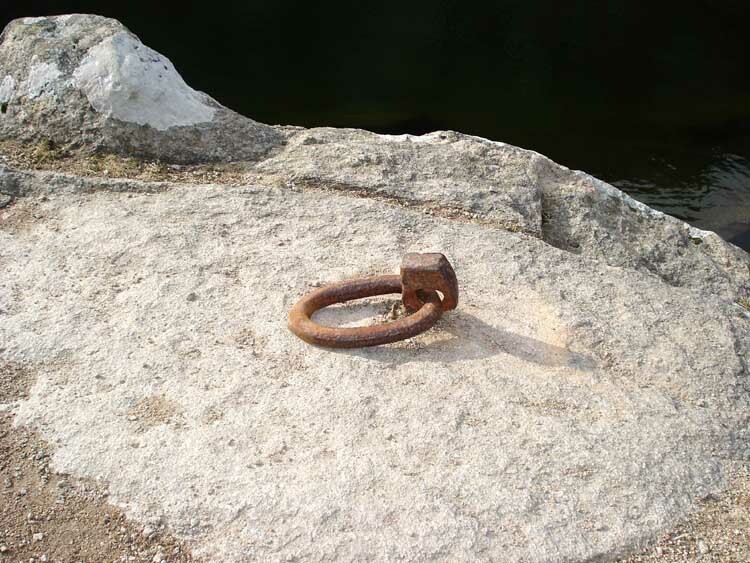 An iron ring fastened into a granite stone. 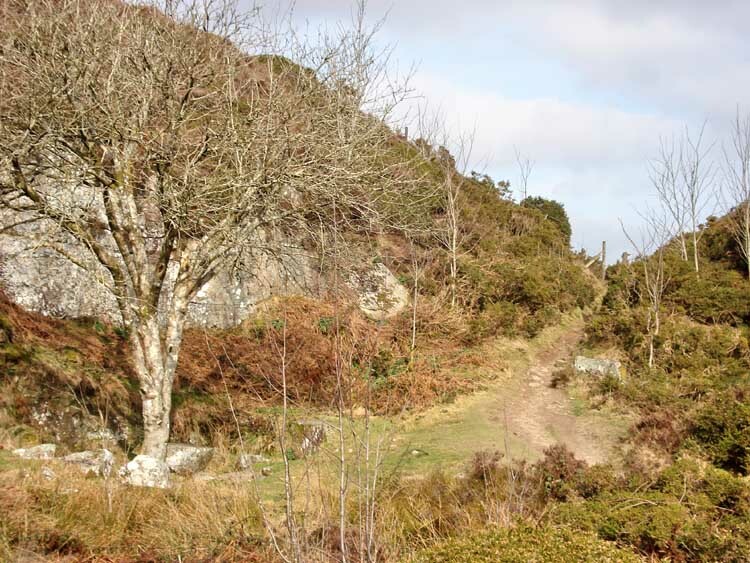 The path around the quarry. 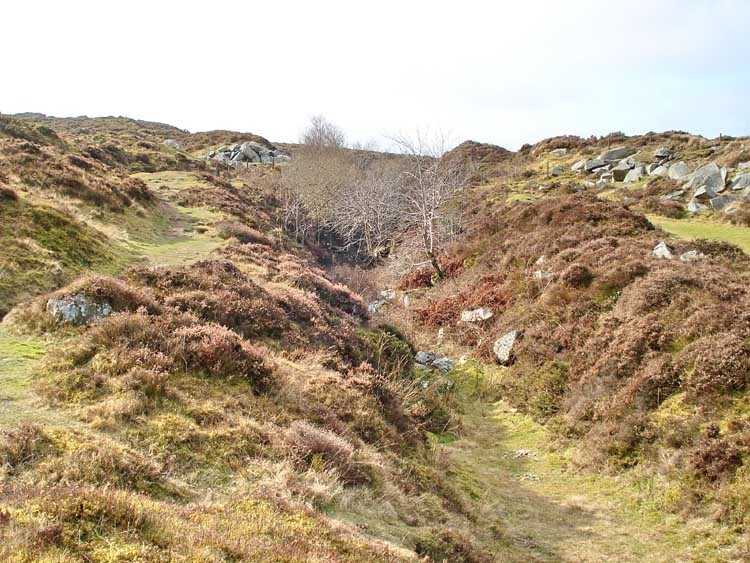 Looking towards the quarry entrance, now blocked, shown in an earlier photo from outside the quarry. 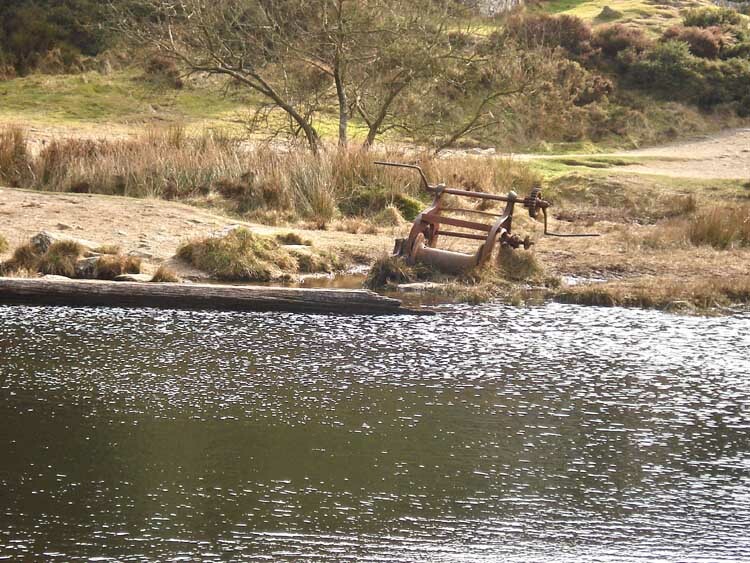 Another view of the crane winding gear, possible jib, looking towards the quarry entrance. 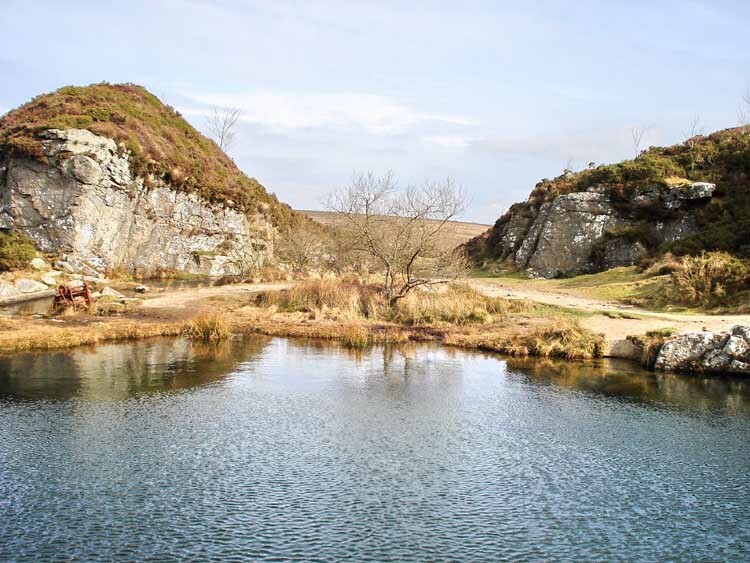 A view inside the quarry. 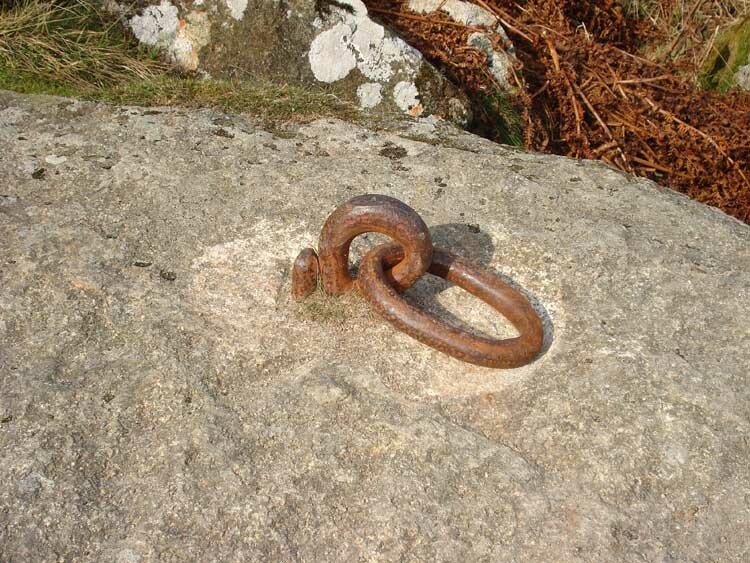 Two iron pins driven into the granite. Another view of the crane mechanism. 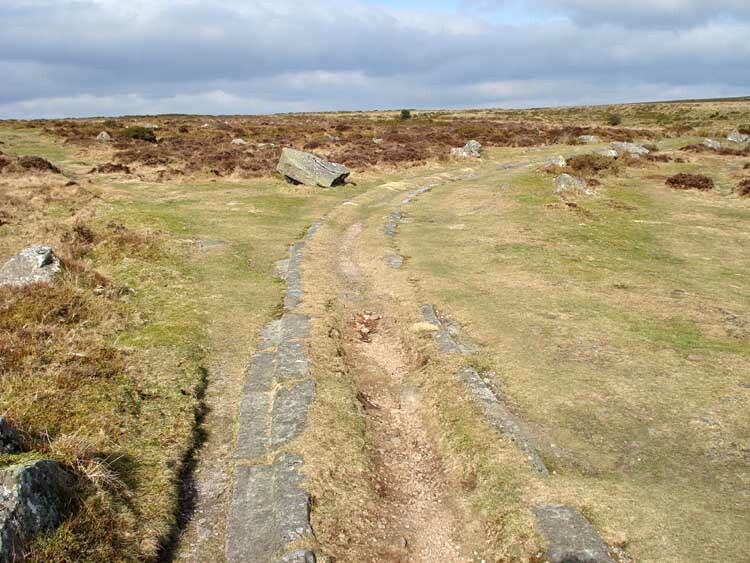 A curve in the granite tramway. 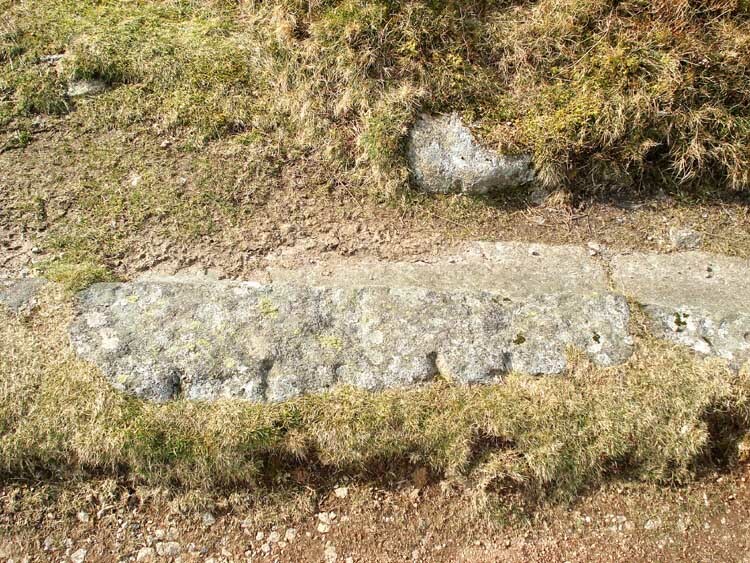 A granite tramway stone with the outer, lower level of the track at the top of the photo. Note the feather-and-tare marks from the splitting of the rock, towards the bottom of the photo. 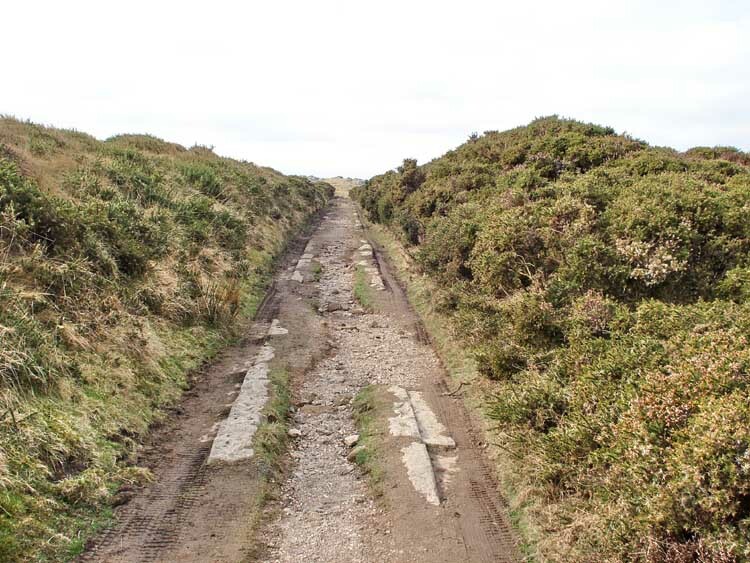 Tramway junction, note the hole in the stone beside the railway, these are seen at most of the junctions. 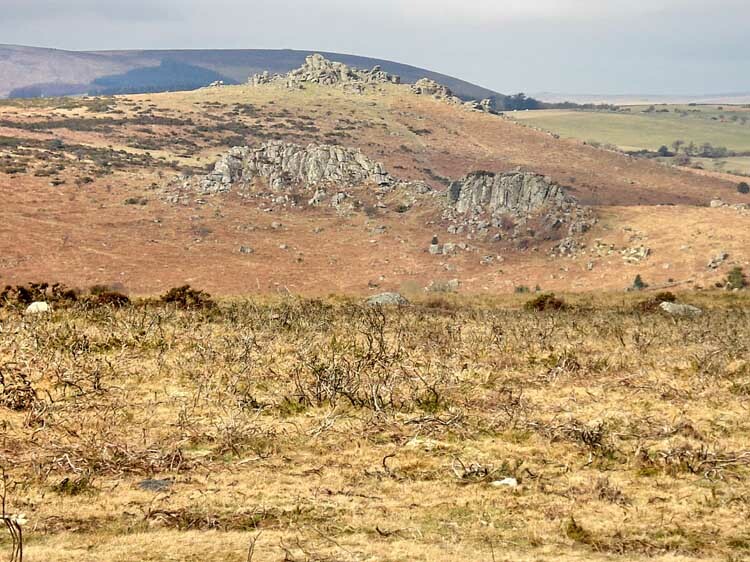 Looking to Hound Tor with Greator Rocks in the middle distance. 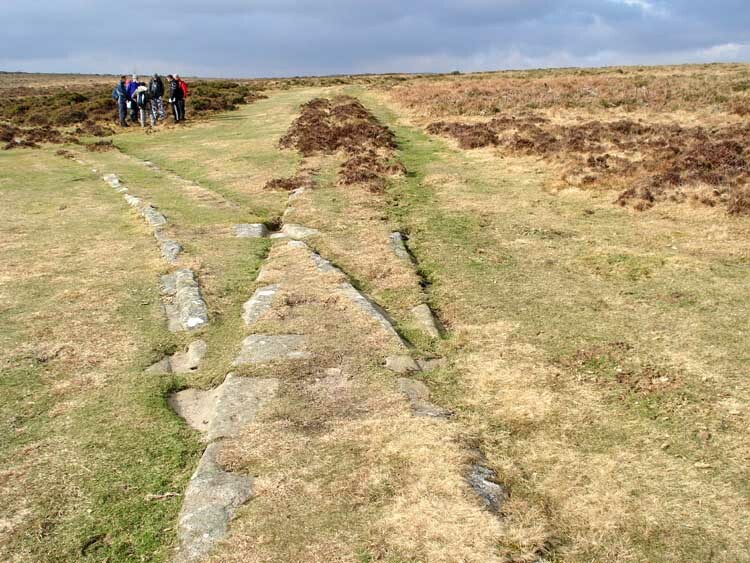 Another junction in the tramway, with another hole in the rock on the righthand side. Derelict building en route to the second quarry. 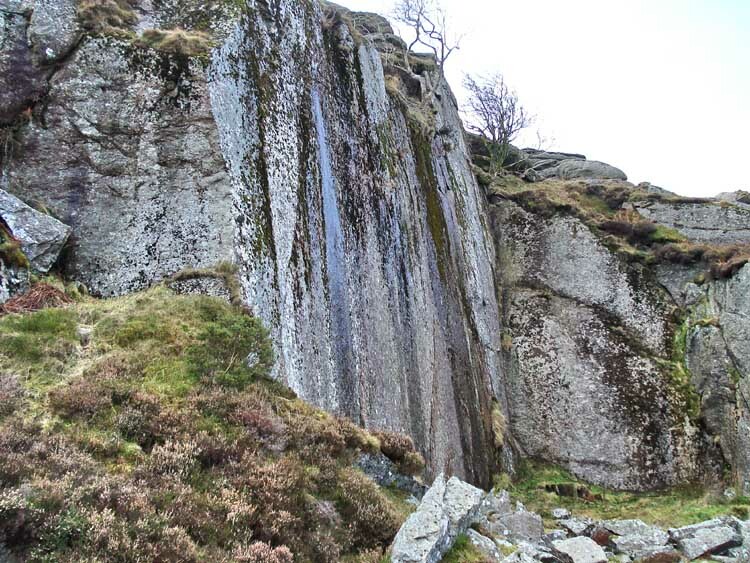 The main rock face at the second quarry, at SX 75135 77756. It looked as if it had been cut with a cheese-wire. 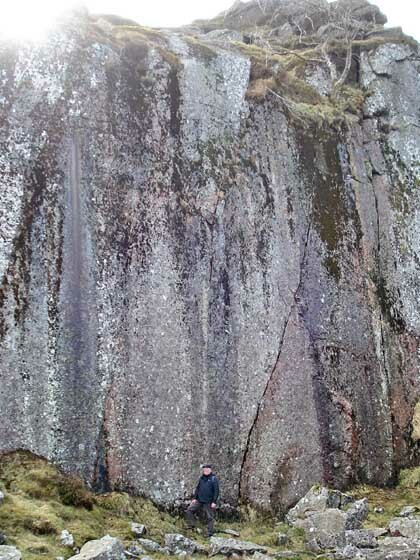 Ron (6 ft 3 ins / 1.90 meters) at the quarry face, indicating it to be 46 feet (14.25 m) high. 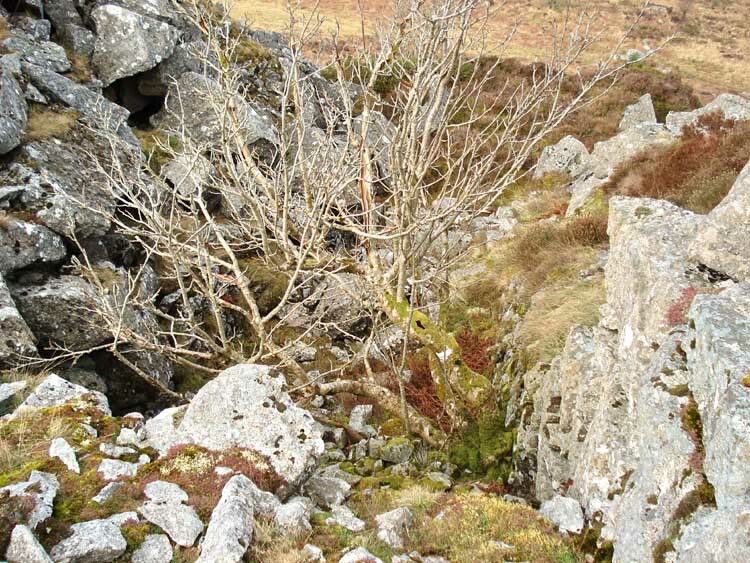 Looking down on a tree growing in a section of the quarry. 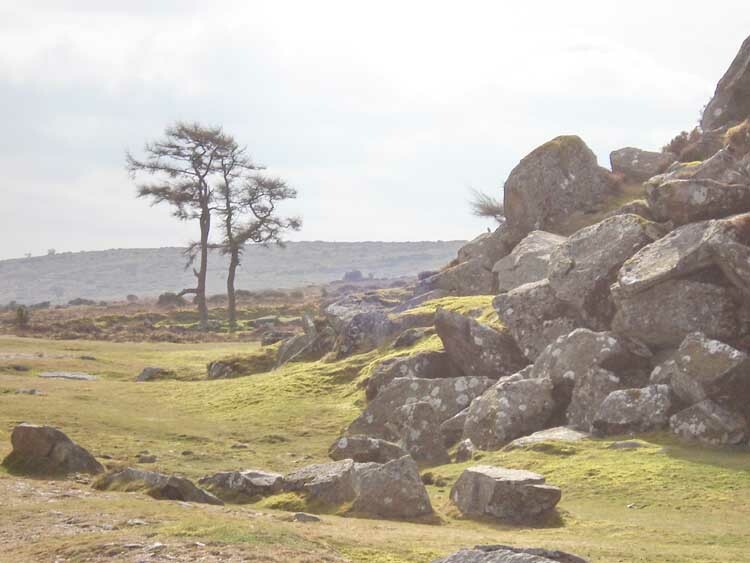 Looking up at Holwell Tor, SX 74978 77578. 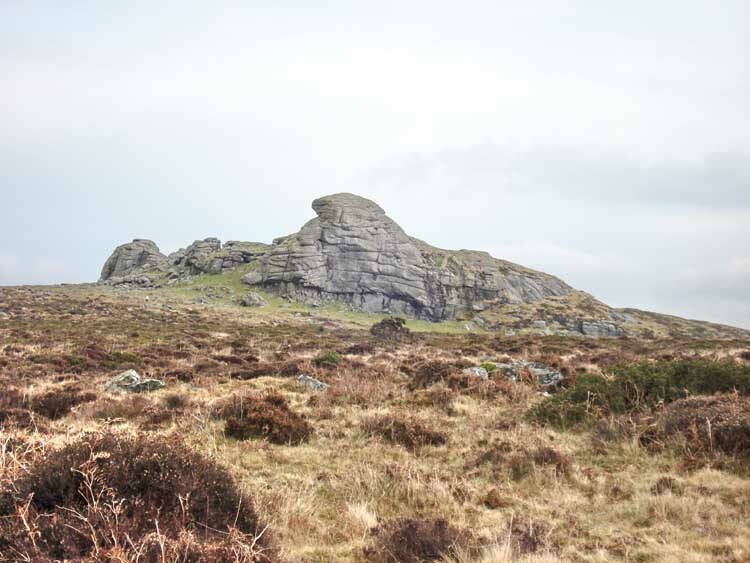 Zoomed view of Haytor Rocks. 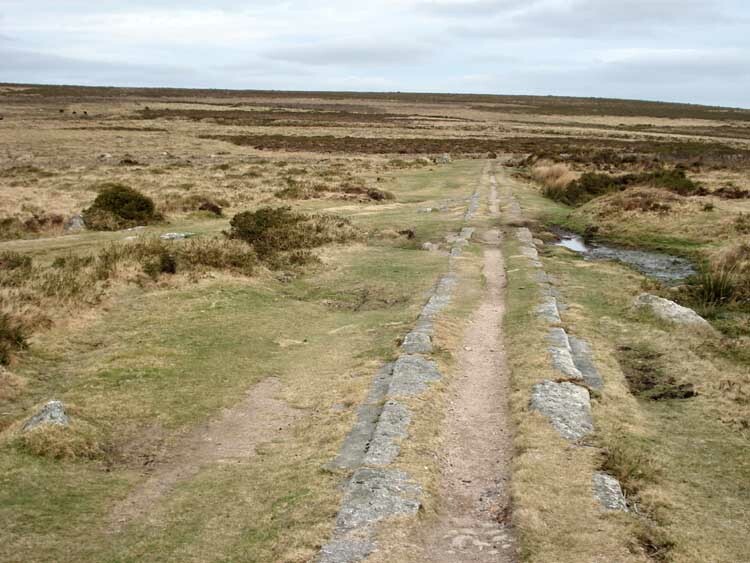 The granite tramway across the open, high moor. 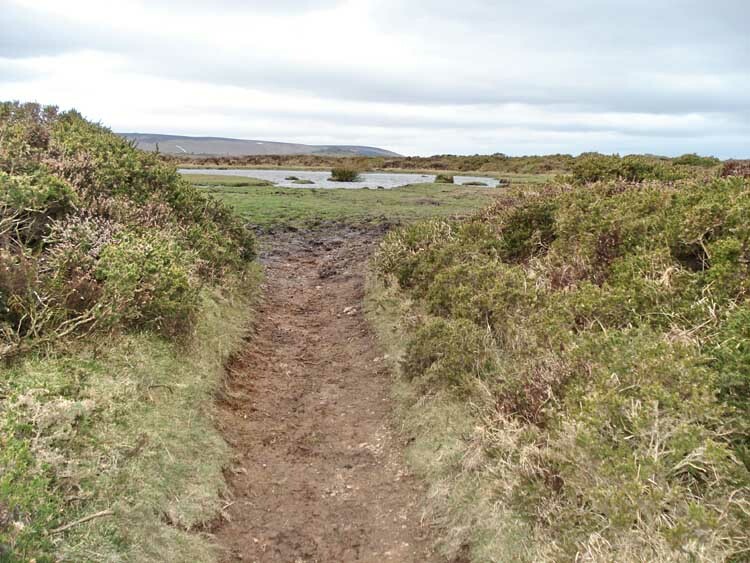 Small lake at SX 75898 77821.
on behalf of The Controller of Her Majesty's Stationery Office. © Crown copyright. All rights reserved. Licence number 100047373. 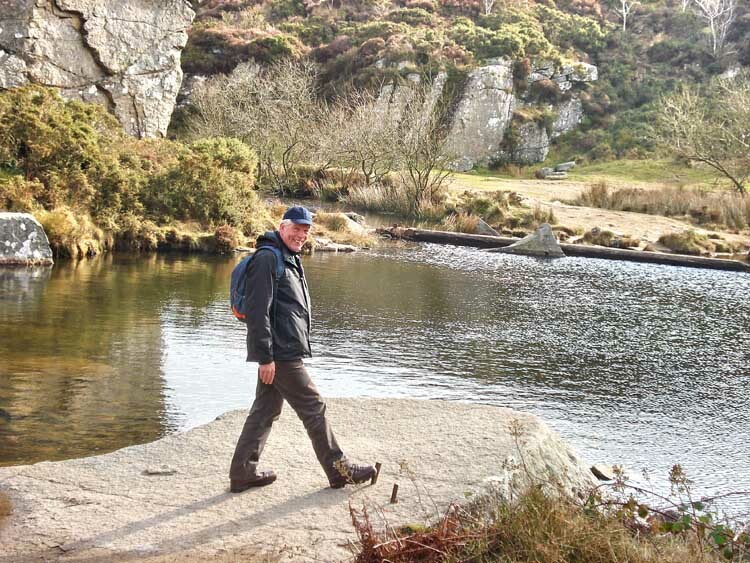 Access to this walk was by road from Bovey Tracey, off the A382, following signs to Haytor. 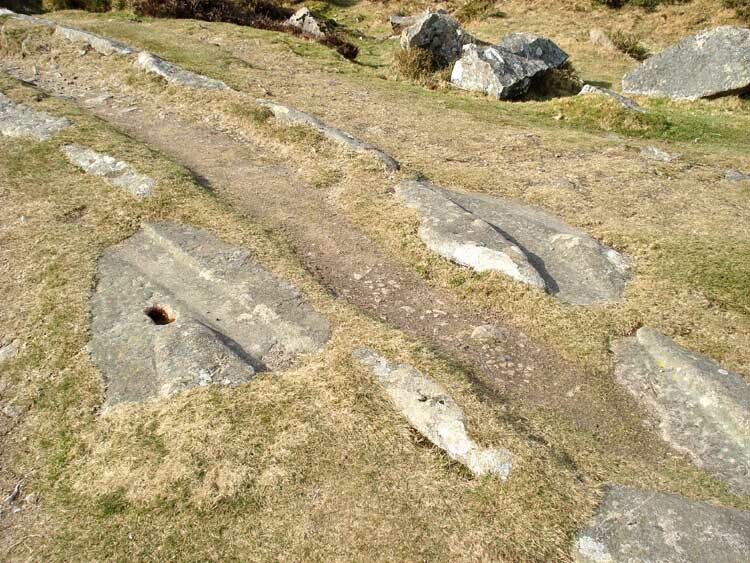 Parking was at the P symbol on the map on Haytor Down, near the spot height figure of 363. Distance - 6.80 km / 4.23 miles. Start 10.50 am, Finish 2.40 pm, Duration 2 hr 50 min. Moving average 3.6 kph / 2.24 mph; Overall average 2.5 kph / 1.55 mph.